Some of the season’s best plays have a basis in reality. John Guare’s 1990 play “Six Degrees of Separation” is based on a con man named David Hampton, who duped some prominent New Yorkers. The tragi-comedy is currently being revived with style at the Ethel Barrymore Theatre. In “Six Degrees,” Paul (a young African-American) shows up in the upper east side apartment of Flan and Ouisa. He claims to be the son of Sidney Poitier and a college friend of their children. Paul knows many details about their lives, including their Kandinsky painting, and oozes charm. They invite him to stay the night but realize something is wrong when they wake up to discover that he has brought a male prostitute into their home. 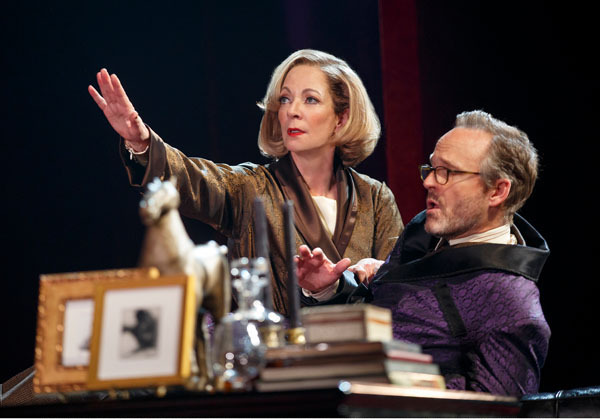 Allison Janney and John Benjamin Hickey in SIX DEGREES OF SEPARATION. Photo by Joan Marcus. They throw him out but he continues his scam with others until he is arrested. Guare is at his wittiest and has a lot to say about class, race, economic inequality and identity. Trip Cullman’s production has a top flight cast, with the tart-tongued Allison Janney as Ouisa, John Benjamin Hickey as her art dealer husband and Corey Hawkins, who is memorable as Paul. 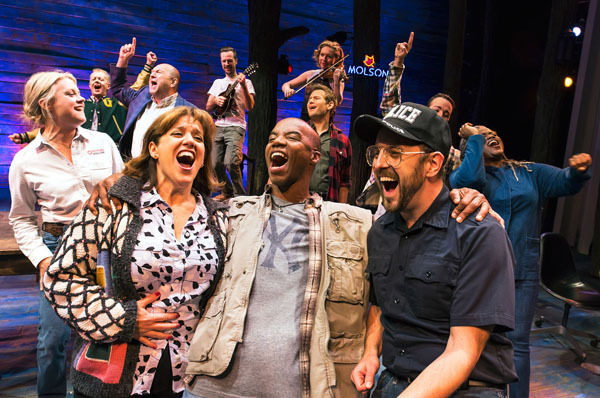 The surprise musical hit of the season is “Come From Away” (at the Schoenfeld Theater). Gander is a small town with an airport in Northeast Canada, where 38 planes were forced to land on 9/11 after air traffic was halted as a result of the terrorist attacks. The townspeople opened their homes and their hearts to the 1,700 travelers. The 12 cast members, under the skillful direction of Christopher Ashley, play multiple roles, including passengers, crews and Gander inhabitants. The script and songs were written by the husband and wife team of Irene Sankoff and David Hein. They had conducted interviews with the Gander locals and a number of the travelers, who returned on 9/11/11 for the 10th anniversary celebration. The whole cast is terrific but the standout is Jenn Colella as a pioneering airline pilot. The cast of COME FROM AWAY. Photo by Matthew Murphy. “The Glass Menagerie” (at the Belasco Theater) is Tennessee Williams’ haunting 1944 memory play about his mother and sister and his eventual abandonment of them. Director Sam Gold takes a stripped down approach, so that there is basically no set other than a table and chairs. Sally Field is immensely moving as the mother Amanda Wingfield, who was once the belle of the ball but chose the wrong man. Joe Mantello is older than actors who generally play Tom (the stand-in for the playwright), Madison Ferris is Tom’s reclusive sister Laura and Finn Wittrock is the gentleman caller. Ferris is more severely handicapped than Williams envisioned for Laura—she is the first actress in a wheelchair to play a leading role on Broadway—but there is no question that the actress is heartbreaking in the role. 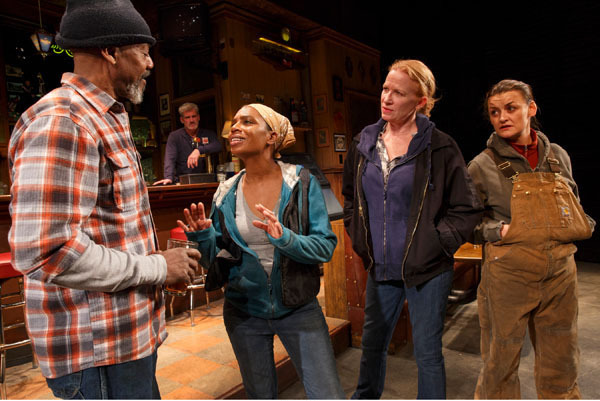 Lynn Nottage’s “Sweat” is the winner of this year’s Pulitzer Prize for best play. The work (at Studio 54) is the result of interviews conducted by the playwright and her director Kate Whoriskey with the residents of Reading, Pennsylvania. The city had been a center of industry in the early 20th century but became America’s poorest city in the last decade. John Earl Jelks, James Colby, Michelle Wilson, Johanna Day, and Alison Wright in SWEAT. Photo by Joan Marcus. The play starts in 2008 with two men attempting to make the transition from prison life to the outside world. The action then goes back to 2000, when they and their mothers work in a factory. They endure salary cuts and downsizing, leading to strikes and lockouts and the taking of their jobs by immigrants, culminating in a violent reaction.